And there's full file of them. I also did this document.title animation with them, which demonstrates that they work even outside HTML. These characters are emojis that are recognized by the Unicode standards which defines what each character presents. The exact look for them is different for each OS, and each application, but all depict the same thing. The globe (🌏) is Unicode character 1F30F and is called EARTH GLOBE ASIA-AUSTRALIA. the 2nd one (✅) is called WHITE HEAVY CHECK MARK and is Unicode 2705. 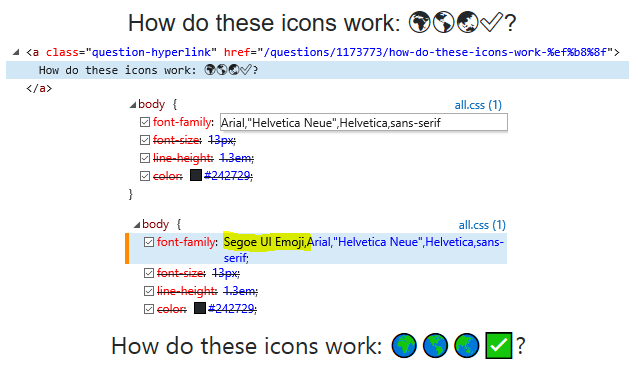 Firefox is using a special font for these emoji characters. It's employing a relatively new and otherwise rarely used feature of TrueType fonts: layered colour glyphs. Other than that (i.e. having a special font with pre-coloured glyphs) these icons are ordinary Unicode characters. Windows has native support for these coloured fonts only in versions 8.1 and onwards, thus Firefox installs EmojiOne privately and uses its own font renderer for it in Windows 7. This also explains the absence of colourful emoji icons in most other applications. In short: Firefox uses a font in which these symbols look the way they do. These characters are a part of the Unicode Standard. Thus, unlike ASCII (which had very few), Unicode contains several symbol sets. Now while it has been standardized on what code should represent what alphabet or symbol, Unicode does not exactly specify how the symbol should look like. Thus, all operating systems have their own sets of symbol graphics to look different. This may include some being colored and some being just outlines or black and white. Also, it is also possible for fonts to have their own set of art for these symbols so that the characters can go with the feel of the application. Even inside the application, you may have different pages using different sets of images. Thus, you can interact with the character like you would otherwise, but it would just look different. You can see how exactly emoji (for 🌍🌎🌏, skip to #1483) look on various platforms here. These characters "work" the same way as other characters, such as a, ø, λ, ଶୁ, に and 晨, work. Characters are represented by an abstract number, which is used to select and index an available font to display the character. On your system, it appears that Firefox does its own rendering, and has access to fonts containing glyphs for🌍, 🌎, 🌏 and ✅️. Other applications will normally use the fonts made available by the X server (or equivalent), so be restricted to fonts you've installed or pointed your server at (e.g. with xset +fp or similar). Multi-colour fonts are a recent and still fairly experimental development; traditionally, font glyphs are a single colour that can be composed against any background. This post over on Graphics Design Are there any free Emoji fonts? might also be interesting. Without such a custom icon font, you have to keep in mind, that your website will look different in every browser. This is just a list intended to guide people to emojis and unicode smileys faster. Those are just Unicode characters so any textboxes that support Unicode can display them without problem, provided the font and glyphs are available on the system. However the look and feel for each Unicode character depends on the renderer and font used for them. Traditionally characters are filled only with a single color. Colored emojis are a quite new thing, hence their support varies from platform to platform. Various techniques have been invented for coloring like embedded PNGs, SVGs or layered masks. But all of them require a new renderer which was not available in older OSes. Not the answer you're looking for? Browse other questions tagged firefox unicode or ask your own question. Some Unicode characters work everywhere but not on Firefox, why? Even on Windows 7, can you do a “dir” and be able to see filenames that has unicode characters? Per-character-set font size in Firefox not working? Correct U+23F4 and U+23F5 unicode characters?